Today's card features clear stamps from a set by Art Impressions that are licensed through Hampton Art. Make card base for a 3.75” x 5” marigold card and round bottom corners. Cut 3.25" x 4.5" white card stock panel and round corners. Cut 3.5" x 4.75 PP panel, round corners, and adhere to card front. Stamp cat on panel and color with pencils. 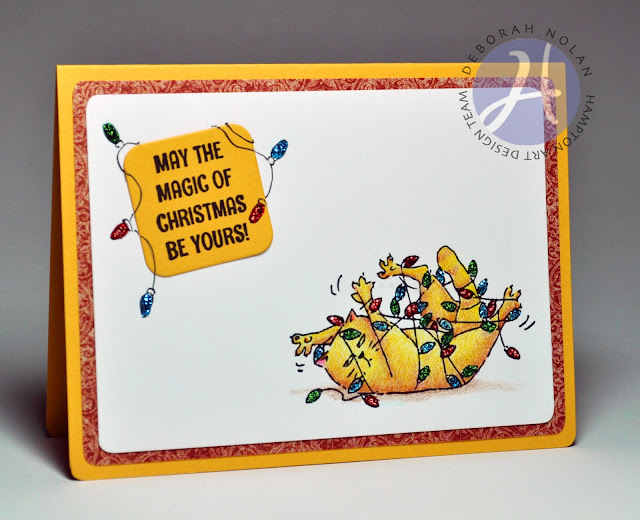 Adhere stamped panel to card front. Cut square of marigold card stock, round corners, stamp sentiment, and adhere to stamped panel. Draw a string of light bulbs around the sentiment square. Apply Stickles to light bulbs and allow to dry.